The Stromsholm Canal is one Sweden’s longer canals. It follows the Kolbäck’s River from Smederevo on Lake Barken in the north through the municipalities of Fagersta, Surahammar and Halstahammar to Strömsholm in the south where it empties into Lake Mälaren. It is 107 km long though only 12 km of that have been man-made. 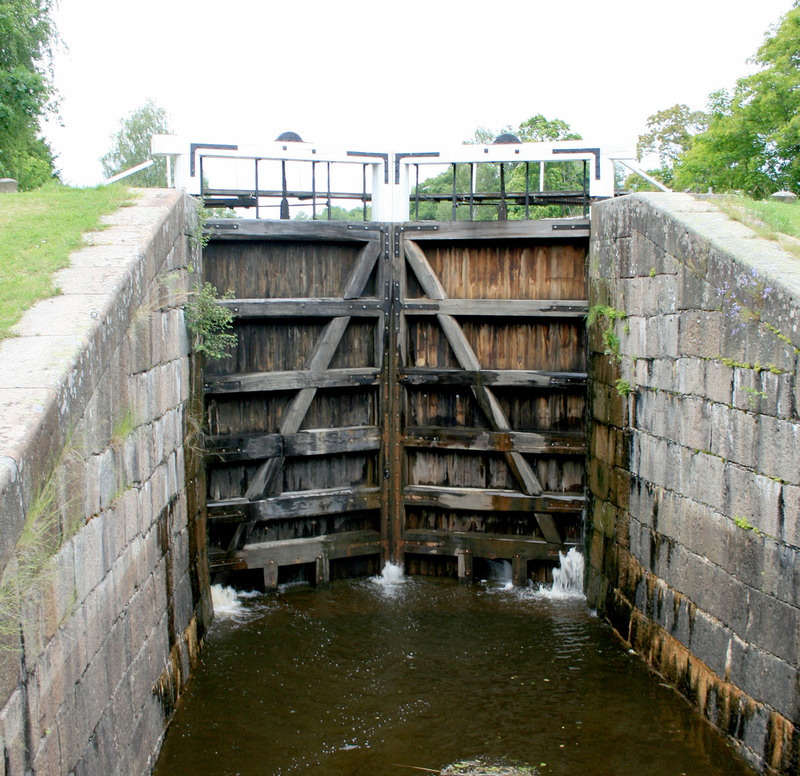 There are 26 locks and a total altitude difference of 99 meters between the Lakes Barken and Mälaren. Construction of the canal began in the late 1700’s as a means to meet the transportation needs of the local industries. Finished products from the mills around Smedjebacken, Fagersta, Virsbo, Ramnäs, Surahammar and Halstahammar had to be transported to Västerås and Stockholm and ports beyond. The canal was mapped in 1774 after which Strömsholms Slusswerk (a company) formed 1776 Kanalbygget which began in 1777 led by Johan Ulfström. Ulfström had previous experience from the rebuilding of the Hjälmare canal and various other buildings in Uppsala. The canal was opened in 1787 by King Gustav III but was only fully completed in 1795. To celebrate its completion, the king took a sloop from Lake Barken to Halstahammar with stops for celebration at the mills along the way. All the locks were baptized by the king on the journey. By the mid 1800’s it became clear the canal could not meet the transportation needs of the mills. Beginning in 1842 refurbishment of the canal was undertaken led by Lieutenant Colonel Johan Edström and, after him, Johan af Kleen. The canal was widened and deepened as well as three locks were built brand new. The renovation of the canal transformed Strömsholms Slusswerk to Strömsholms Nya Kanalaktiebolag (Strömsholms New Canal Company Limited). Both the building and renovation in the 1800’s raised the possibility of extending the canal to Ludvika and Lake Väsman and on to the Dalälven (The Dal River). Those various, repeated proposals were finally terminated in 1941. Approaching the mid 1900’s the canal lost its importance due to the increase in road and rail traffic. In 1940 the traffic was minimal causing consideration to close the canal. In the 1960’s the municipalities along its length became involved with the canal. Restoration was undertaken from 1963-1970. Now it is used for recreational traffic.